One of the challenges in doing research in Chicago and Cook County is that many early births weren’t reported to the county clerk’s office. In other words, many people born in the late 1800s and early 1900s in Chicago didn’t have a birth certificate. Baptismal records are usually a first-choice option for proving a birth date when no birth certificate can be found, but United States passport applications are another good source of birth information. They can be found on Family History Library microfilm, but they have also been available for some time on Ancestry.com. Here’s an example from my own research of how helpful they can be. A Wilmette birth would have had a Cook County birth certificate (they were kept separate from the Chicago birth certificates) but I wasn’t successful in locating an entry for Lucy in the Cook County birth registers on my first try (the registers serve as a helpful index to birth certificates) and even after I learned her birth date, I still wasn’t able to find her name in the register. I also checked the Chicago birth certificates with no luck. It was quite a find. 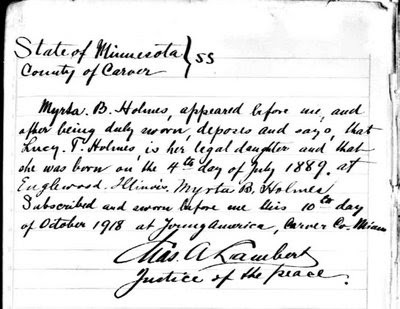 From the application I learned that Lucy was born “on or about the 4th day of July, 1889” and this was supported by an affidavit from her mother, Myrta B. Holmes. I finally knew when she was born. I also learned that her middle initial “T” stood for Theodate which meant that she was named after her maternal and paternal grandmothers, Lucy Thyrza Beers and Theodate Page Price. This was particularly interesting to me. 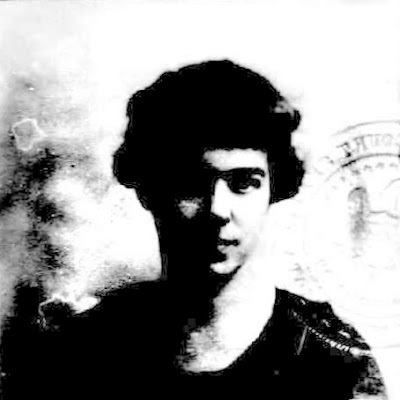 Did it mean that Myrta knew something of H. H. Holmes’ parents, and if so, did she know them as “Holmes” or did she realize that her husband had been born “Herman Webster Mudgett?” Or did it mean that Holmes, without explanation, had suggested Theodate, his mother’s name, as a middle name for his daughter? In this case the place of birth was significant. If Lucy was born in Englewood, she might have been born in the apartment above the drug store that Holmes ran. Holmes castle, according to The Devil in the White City, was only half completed in the summer of 1889 and Holmes didn’t move into the building until the following year. (p. 71) And if Lucy was born in Englewood, it seems reasonable to assume that Holmes attended the birth. This opens up all sorts of questions about the relationship between Myrta and her husband. 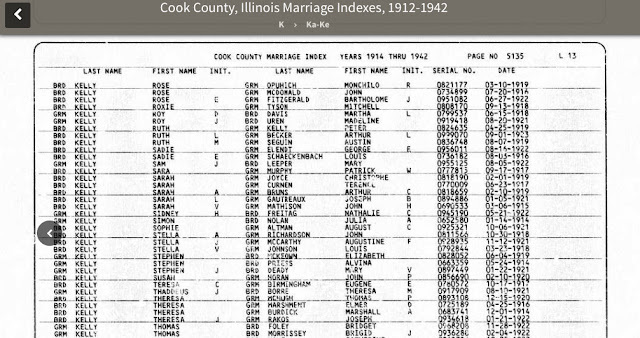 Did Myrta go to Englewood just before Lucy’s birth or did she, perhaps, move back with Holmes before Lucy was born after spending time in Wilmette with her parents? (Holmes eventually built a duplex in Wilmette and Myrta and Lucy lived on one side and Myrta’s parents lived on the other.). And, if Holmes attended the birth, was he the only one there? Or would Myrta’s mother have perhaps been there, too? What was it about the relationship between Myrta and Holmes that allowed her to survive unlike many of the other women he was attracted to? These questions fascinate me and I hope, one day, to find some answers, but back to the topic at hand. The important point here is this: If you’re looking for evidence of a birth in Chicago and haven’t had any luck finding a birth certificate, consider taking a look at passport applications. You might find yourself well-rewarded. In this case, I not only found a birth date and place, but the passport application included a photograph of Lucy in her late twenties. I was finally able to “meet” the person that, through other research, I had come to know so well. Today is the 120th anniversary of Lucy Holmes’ birth. Happy Birthday, Lucy. Images used in this blog posts are from Ancestry.com. U.S. Passport Applications, 1795-1925 [database on-line]. Provo, UT, USA: The Generations Network, Inc., 2007. 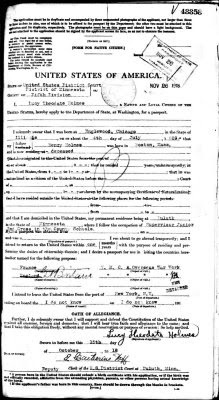 Original data: Passport Applications, January 2, 1906-March 31, 1925; (National Archives Microfilm Publication M1490, 2740 rolls); General Records of the Department of State, Record Group 59; National Archives, Washington, D.C.